Become a national model for undergraduate education by demonstrating that students from all backgrounds can achieve academic and career success at high rates. As the Atlanta campus of Georgia State University has grown, our student body has retained the characteristics that make the university one of the most distinctive public research institutions in the nation and a destination of choice for high-ability students from all backgrounds. The opportunity to teach and learn in such a rich environment is one of the university’s greatest strengths. Our goal is to continue to position the university as a place where high academic standards join outstanding student support to produce academic success for diverse populations. 2011 INITIATIVE 1: Increase the level of scholarship support for undergraduate students. The ability to recruit highly qualified students as well as the academic performance of enrolled students are both greatly influenced by the level of a student’s financial need. Although the academic ability of our students has been steadily increasing, their socio-economic profile is unique for a research university in that nearly 90 percent of students qualify for financial aid. To enhance Georgia State’s ability to attract the best students and to address the detrimental effects of financial need on student recruitment, retention and graduation, the university proposes doubling the level of institutional support for merit- and need-based scholarship funding. This support also will assist in expanding our unique retention programs such as Keep HOPE Alive, which gives students an opportunity to participate in academic and financial aid counseling and intensive academic skills development. Central to increasing the effectiveness of our scholarship offerings is the development of an Office of Fellowships and Scholarships that connects students with a range of internal and external scholarships. Since 2010, institutional need-based grants have increased from 178 recipients and $142,044 in awards to 2,129 recipients and $2.8 million in awards in 2015. Since 2010, merit-based grants have increased from 1,098 recipients and $2.3 million in awards to 4,007 recipients and $9.3 million in awards in 2015. A Scholarship Resource Center was established in 2011 to offer guidance and support to students seeking financial assistance. Since opening, it has had 3,070 visits and 6,000 applications for scholarships. A database now includes more than 400 institutional scholarships and fellowships. More than a dozen innovative retention programs that support Georgia State students have been implemented in the last five years. Many of these programs have grown significantly even during the recent recession and increases in students’ unmet financial need during this period. The University Assistantship Program has been expanded to support Honors College students. Incoming freshmen are matched with a department or office of interest to provide an experiential learning opportunity as they work on special projects or research, typically earning a stipend of up to $2,500 for their work. There are now a record 232 assistantships ranging from research lab work to participating in special ensemble performances. Georgia State’s top academic scholarship supporting honors students, the Presidential Scholarship has been expanded from seven scholarships in 2012 to 10 in 2015. This scholarship provides eight semesters of tuition support, a stipend for textbooks and living expenses, a paid university assistantship and a stipend for study abroad. These nationally competitive scholars enjoy peer mentoring, small group discussions with visiting professors, and numerous social, service and leadership opportunities. The establishment of a Student Financial Counseling Center organized around analytics-based proactive outreach — one of the first of its kind in the nation — is the next component of the focus on addressing the financial needs of students. 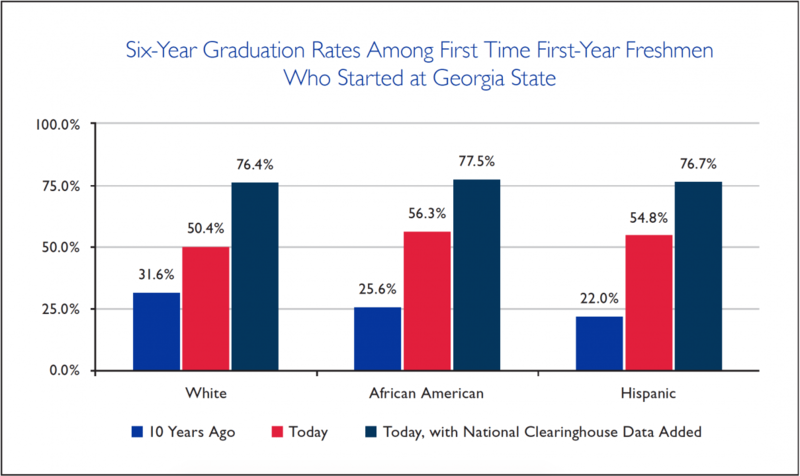 This center will work to mitigate the financial risks to student retention by using 10 years of student financial data and more than 140,000 Georgia State student records to provide predictive analytics, identifying when students make decisions that put them at risk of increased financial hardship and attrition. 2011 INITIATIVE 2: Establish a Student Success Center. A University Advisement Center was established in 2013 to improve communication and support of undergraduate students. More than 40 new professional advisers were hired. This resulted in the student/adviser ratio being lowered from more than 700 to one to the national average of 300 to one. In addition, Georgia State implemented a cutting-edge, analytics-based advising tracking system, GPS Advising, in 2012. Based on more than 2.5 million historical Georgia State grades, the system tracks 800 different attributes related to academic progress for each undergraduate every day. In 2014, academic advisers had 43,000 one-on-one meetings with students that were prompted by alerts from GPS Advising. In part because of such interventions, the number of unneeded courses — courses students enroll in and pay for that do not advance students towards completion of their degrees — has declined by an average of five credit hours per graduating senior over the past two years, saving students an estimated $10 million in tuition and fees annually. 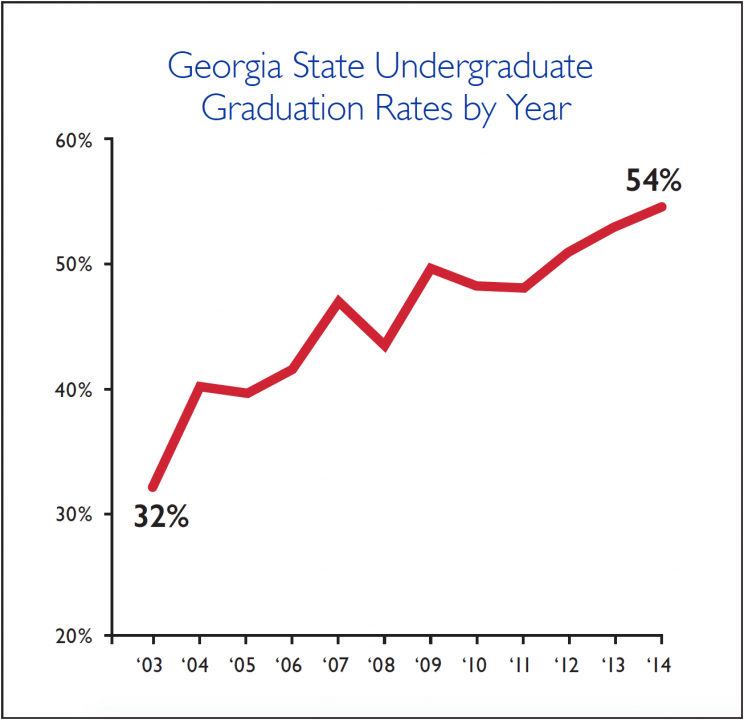 2016 INITIATIVE 2: Reduce the time to earn a Georgia State undergraduate degree. The university will reduce time to graduation, thereby reducing the costs associated with unnecessary courses and credit hours, by using innovative strategies such as classroom optimization algorithms to realign the schedule of classes, expanding the use of online and hybrid courses, and providing greater connectivity across units on shared programs. A Student Financial Management Center will use analytics to proactively identify student financial problems and provide students with financial tools and counseling. 2011 INITIATIVE 3 : Implement an Undergraduate Signature Experience. The Undergraduate Signature Experience Program, created in 2012, includes experiential learning options for students. It includes internships, research experiences, community service-learning projects, field studies, study abroad trips, clinical rotations, student teaching, honors thesis preparation and other experiential opportunities for students outside the classroom. There are six broad categories of signature experiences available to students: Arts, City, Global, Professional, Research and Service. There are more than 350 signature experience options. All departments with undergraduate programs offer at least one signature experience option and 49 percent of all departments require a signature experience in their undergraduate major and/or minor curricula. In 2014-15, more than 13,000 signature experiences were completed by students, more than 4,000 students were involved in civic engagement and more than 1,000 internships were completed. Preliminary evaluation data suggest that students realize advances in critical thinking, communication, professional networking and confirmation of academic goals during signature experiences. A cooperative education (co-op) program has been added as an option in select departments. Co-op students work full-time for six months as paid co-op employees in academic field-relevant businesses that are considered a critical component of their academic program. Students can complete two separate co-op placements of work directly related to their majors and do not take classes during their co-op placements. Between co-op placements, students return to complete their academic studies as full-time students. In 2014-15, 16 students enrolled in co-op. 2016 INITIATIVE 3: Establish new pathways that facilitate seamless college to career transitions. 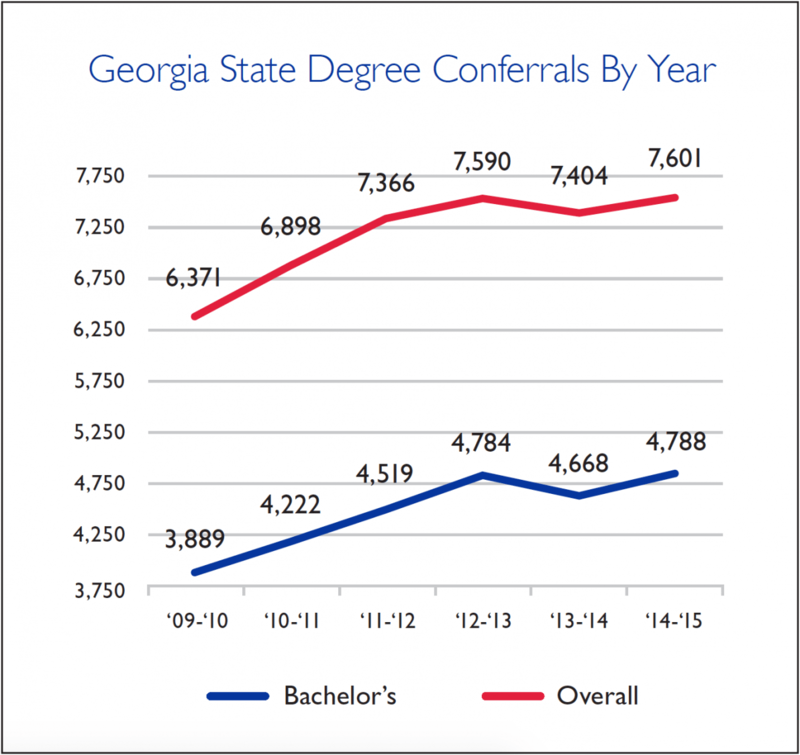 The academic success of Georgia State students must translate to careers that make meaningful contributions to society. To achieve this objective, the university will create innovative pathways to enable students to translate college to career. These pathways will include experiential learning through internships and varied signature experiences, opportunities to develop entrepreneurial talents, and an E-portfolio that will capture the breadth and depth of their experiences and orient students to the value of life-long learning. We will expand our use of analytics to inform career decisions. 2011 INITIATIVE 4: Establish an Honors College. After a long history of various honors programs at Georgia State, the Honors College was created in 2011 to advocate for the educational experiences and resources needed for high-ability students and moved to new and expanded facilities in 2013. The Honors College fosters a vibrant community to advance undergraduate scholarship, enhance research, foster service and compete for prestigious awards and fellowships. Since its creation, a record 1,600 students have been selected to participate. The college’s 2015 entering freshman class averages a high school grade point average of 3.8 and SAT scores that are more than 20 points higher (1320) than they were in 2012. The Honors College also has produced 10 national award recipients: a 2015 Goldwater Scholarship winner, a Marshall Scholarship finalist, numerous Fulbright winners and winners of several other prestigious national awards and fellowships. In keeping with the university maxim that students from all backgrounds can succeed, the Honors College student population is about 50 percent Pell Grant-eligible, has numerous first-generation college students and mirrors the diversity of the university. 2016 INITIATIVE 4: Find the balance between technology and human interaction in instruction so that education and student success outcomes are greatly enhanced. Georgia State is committed to using new technologies to create an academic environment that enhances teaching and learning for all students. Our use of analytics and adaptive learning systems will allow us to individualize the students’ experiences in their coursework just as it has improved and focused our advisement. The use of analytics allows us to customize students’ learning experiences, allowing us to deliver individualized instruction at scale.